Finger food is the perfect choice for any party. A unique twist are “pocket pies” that are easy to tote for a pot luck party, game watching or holiday entertaining. 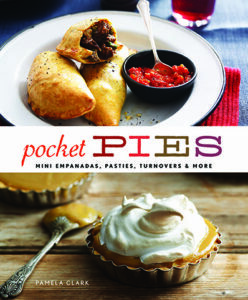 Pamela Clark, cookbook author of Pocket Pies: Mini Empanadas, Pasties, Turnovers & More has loads of recipes from savories to sweet. The beautifully photographed cookbook offers endless ideas. We like Chorizo and Potato Galette with Green Olives, Smoked Salmon Vol-au-Vents followed up by her most perfect Tiramisu. Preheat oven to 425°F. Line two cookie sheets with parchment paper. Place pastry on trays. Combine oil, garlic, paprika and rosemary in small bowl. Brush half the oil mixture over pastry, leaving a ½-inch border. Slice potatoes thinly using mandolin or V-slicer. Top pastry pieces with single layer of potato; brush with remaining oil mixture; season. Bake 10 minutes. Top with chorizo, onion and peppers; bake about 10 minutes or until pastry is crisp. 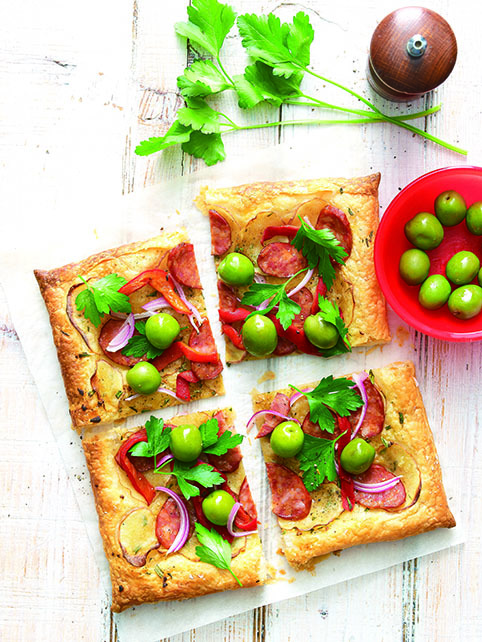 Top galettes with olives and parsley. Reprinted with permission from Pocket Pies: Mini Empanadas, Pasties, Turnovers & More by Pamela Clark, © 2014 Sterling.